Arguably the most important Cosmological discovery ever made is that our Universe is expanding. Its stands, along with the Copernican Principle --- that there is no preferred place in the Universe, and Olbers' paradox --- that the sky is dark at night, as one of the cornerstones of modern cosmology. It forced cosmologists to dynamic models of the Universe, and also implies the existence of a timescale or age for the Universe. It was made possible by in part by Vesto Slipher's measurements of the apparent radial velocities of nebulae, but primarily by Edwin Hubble's estimates of distances to nearby galaxies. Hubble deserves the credit for the discovery of the expansion, even though papers by Georges Lemaitre and H. P. Robertson using Hubble's data on the velocity-distance relation preceeded his 1929 landmark, because it was his systematic program of measuring galaxy distances and his 1924 discovery of Cepheid variable stars in M31 and his actual plot of the relation that finally convinced the community at large. Low level controversy ensued almost immediately. Hubble's initial value for the expansion rate, now called the Hubble Constant, was approximately 500 km/s/Mpc or about 160 km/sec per million-light-years. The expansion age of the Universe inferred from this was only 2 Gyr, but by the 1930's, radioactive dating of rocks had already shown geologists that the age of the Earth was 3 Gyr. Astronomically Hubble's value also caused a bit of trouble, because the scale of the Milky Way itself was moderately well established and Hubble's calibration implied that the Milky Way was far larger than any other nearby galaxy except possibly Andromeda. The astronomer Jan Oort took Hubble's scale to task for this reason in a 1932 paper, but the astronomical community continued to support and use Hubble's value. The solution, at least to the Earth versus the Universe problem, came in the 1950's from a combination of effects including Walter Baade's discovery of Population II stars and his subsequent recalibration of the period-luminosity relation for population I Cepheid variables followed by the realization of a confusion problem at large distances. What Hubble had thought were individual stars in his most distant galaxies were actually star clusters, thus he had not been observing ``standard candles,'' objects whose absolute luminosity did not vary with distance. However, all was not settled. In the 1960's a great controvesy over the value of the expansion rate grew again. Allan Sandage, Hubble's successor at the Mt. Wilson and Palomar Observatories, continued to drive down the value of H0. In the classic paper by Humason, Mayall and Sandage (1956), the value determined was 180 km/s/Mpc. Two years later, in 1958 Sandage pubished a value of 75 km/s/Mpc, and by the early 1970's estimates from Sandage and his longtime collaborator Gustav Tammann were hovering around 55 km/s/Mpc. The dramatic change over 5 decades is shown in figure 2. Meanwhile the competition, in the form of Sidney vandenBerg and Gerard deVaucouleurs continued to obtain values near 100 km/s/Mpc. 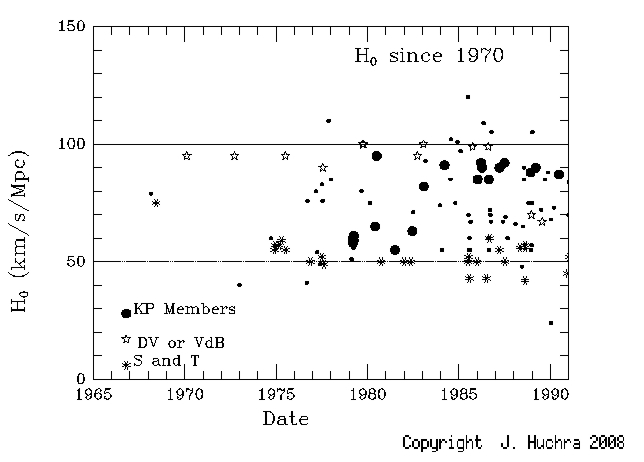 By the late 1970's, this bimodality remained in the estimates of H0 and the middle ground was littered with the bruised and battered remains of young astronomers attempting to resolve the dispute between the two sides. The resolution of the problem came from the telescope that bears Hubble's name. In the early 1980's, prompted by the director of the Space Telescope Science Institute, Riccardo Giacconi, NASA and StScI convened four panels to discuss the concept of Key Projects. These were envisioned as large observational programs of such significant scientific impact that blocks of Hubble Space Telescope time would be set aside and separately proposed for to ensure that these projects would be completed in the early years of the HST mission in case the telescope failed after only a few years. The panels identified three such projects, a study of the nearby intergalactic medium using quasar absoprtion lines, a medium deep survey to be composed of exposures taken in parallel (basically turning on the cameras whenever one of the other instruments was primary), and a project to determine the Hubble Constant. 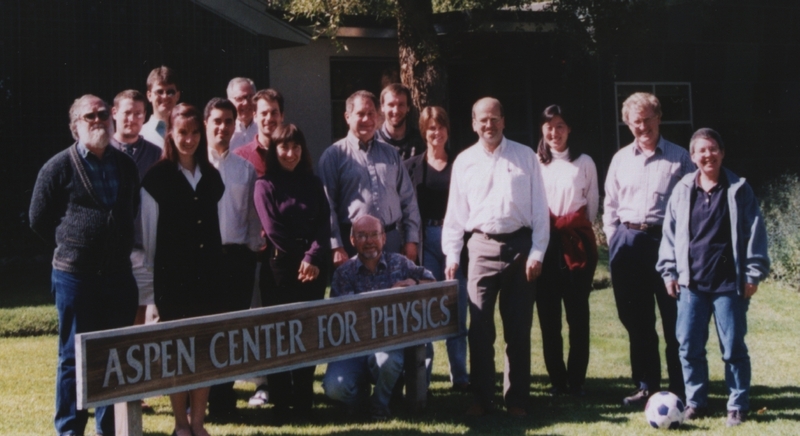 The following summer, a number of astronomers interested in the Cosmic Distance Scale met at the Aspen Center for Physics in 1985 to discuss what to do next. Ostensibly, the program was arranged to give the local theorists (Aspen being the summer home of a large number of theorists!) the current view on H0, but the unstated reason for the meeting was to form a team or teams to propose for HST time. The group tried to combine to write a single proposal, but there really was no way to get the old timers to work with the young turks. In the end, a team of thirteen astronomers agreed to continue meeting to plan the HST project. The first draft of the proposal was prepared in Tucson, under the leadership of Marc Aaronson, a few months later. The original team members included Marc, Jeremy Mould, Rob Kennicutt, Wendy Freedman, Sandy Faber, Holland Ford, Jim Gunn, John Hoessel, Garth Illingworth, John Graham, Peter Stetson, Barry Madore and myself. 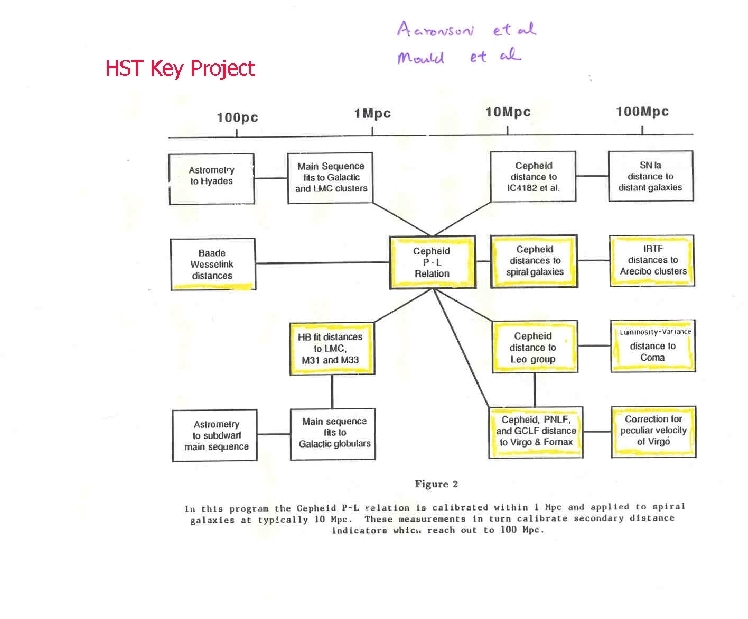 The primary goal of the HST Key Project on the Extragalactic Distance Scale, as the program came to be called, was to beat down the errors, both external and internal, in the calibration of the distance scale to derive a value of the Hubble Constant good to ten percent. Examination of the ``error trees'' for almost all previous determinations of H0 showed that the nearly factor of two range in derived values was not unexpected given the large number of contributing parameters. At each rung of the distance ladder subtle and sometimes not-so-subtle choices introduced both larger and larger discrepancies and errors. The plan we made is shown in the flowchart below. The H0 Key Project has reached its goal of the determination of the expansion rate of the Universe and the Cosmic Distance scale to 10%. Links to the work on individual galaxies can be found at the HST H0 Key Project website. An example of one of our Cepheid fields, that for the Fornax Cluster galaxy NGC1365 is shown here. This image shows the field of the Wide-Field Planetary Camera 2 superimposed on a groundbased image of the galaxy taken with the Dupont telescope at Las Campanas (see Silberman et al 1999, ApJ 515, 1). This plot shows modern (post HST) determinations, including results from gravitational lensing and applications of the Sunyaev-Zeldovich effect. Note the very recent convergence to values near 65 +/- 10 km/sec/Mpc (about 13 miles per second per million light-years). 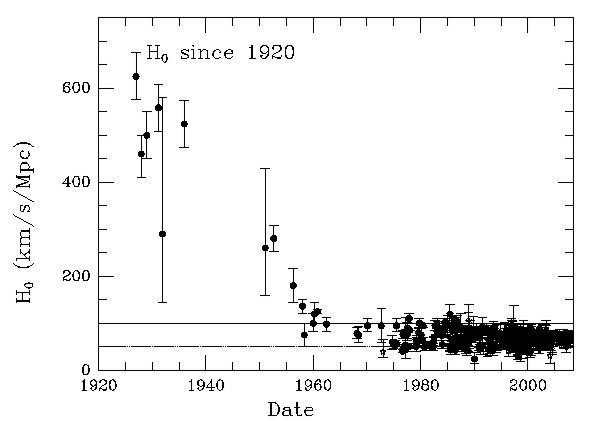 The data for this plot is at hubble.plot.dat and will be updated periodically as part of the HST Key Project on the Extragalactic Distance Scale. Currently, the old factor of two discrepancy in the determination of the cosmic distance scale has been reduced to a dispersion of the order of 10 km/s out of 65-70, or 15-20%. Quite an improvement! 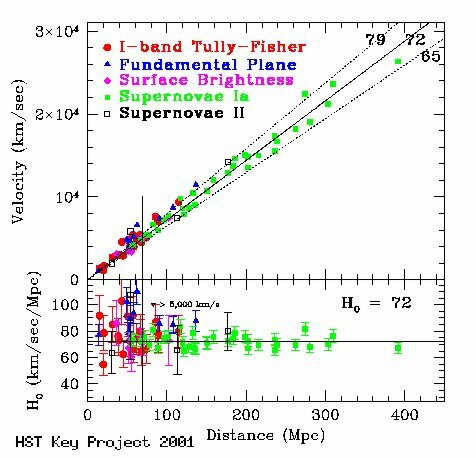 The summary results from the HST H0 Key project are plotted below. With some slight modifications to the Cepheid scale zeropoint, we believe our best value for the local H0 determination is around 71 (+/- 7) km/s/Mpc. Its definitely worth a gander. The uncertainties in the local determination of the Hubble Constant are still dominated by the uncertainty in the Cepheid P-L calibration, followed by uncertanties in the local flow field (non-Hubble expansion galaxy velocities). The current state of published measurements is seen below. One major additional change in the debate since the end of the 20th century has been the discovery of the accelerating universe (cf. Perlmutter et al. 1998 and Riess et al. 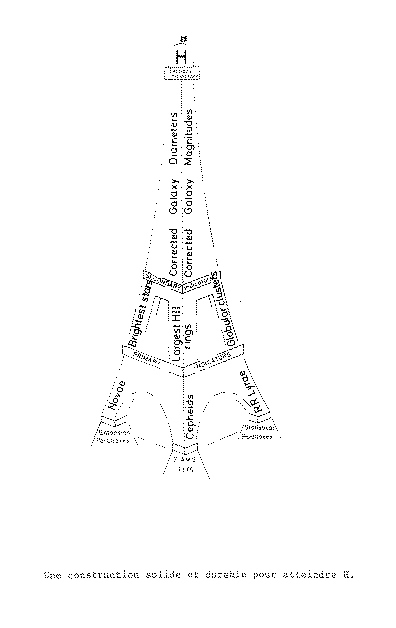 1998) and the development of "Concordance" Cosmology. In the early 1990's, one of the strongest arguments for a low (~50 km/s/Mpc) value of the Hubble Constant was the need to derive an expansion age of the universe that was older than, now, the oldest stars, those found in globular star clusters. The best GC ages in 1990 were in the range 16-18 Gyr. The expansion age of the Universe depends primarily on the Hubble constant but also on the value of various other cosmological parameters, most notably then the mean mass density over the closure density, ΩM. For an "empty" universe, the age is just 1/H0 or 9.7 Gyr for H0 = 100 km/s/Mpc and 19.4 Gyr for 50 km/s/Mpc. For a universe with ΩM = 1.000, the theorist's favorite because that is what is predicted by inflation, the age is 2/3 of that for the empty universe. So if the Hubble Constant was 70 km/s/Mpc, the age of an empty universe was 13.5 Gyr, less than the GC ages, and if ΩM was 1.000 as favored by the theorists, the expansion age would only be 9 Gyr, much much less than the GC ages. 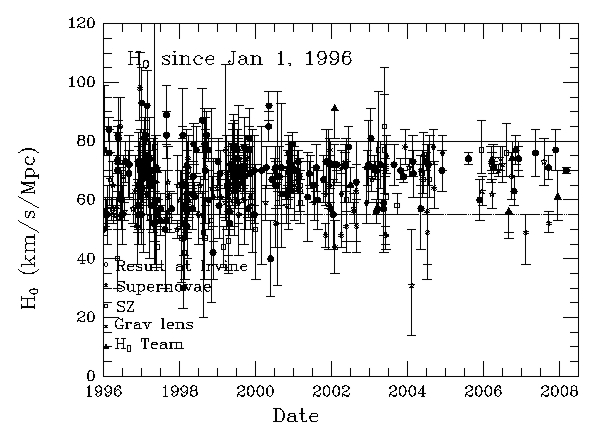 Conversely if H0 was 50 km/s/Mpc, and ΩM was the observers' favorite value of 0.25, the age came out just about right. Note that this still ruled out ΩM = 1.000 though, inspiring at least one theorist to proclaim that H0 must be 35! The discovery of acceleration enabled the removal of much of this major remaining discrepancy in timescales, that between the expansion age of the Universe and the ages of the oldest stars, those in globular clusters. The introduction of a Cosmological constant, Λ, one of the most probable causes for acceleration, changes the computation of the Universe's expansion age. A positive ΩΛ increases the age. The Concordance model has an H0 = 72 km/s/Mpc, an ΩTotal = 1.0000..... made up of ΩΛ=0.73 and ΩMatter=0.27. Those values yield an age for the Universe of ~ 13.7 Gyr. This alone would not have solved the timescale problem, but a revision of the subdwarf distance scale based on significantly improved paralaxes to nearby subdwards from the ESA Hiparcos mission, increased the distances to galactic globular clusters and thus decreased their estimated ages. The most recent fits of observed HR diagrams to theoretical stellar models (isochrones) by the Yale group (Demarque, Pinsonneault and others) indicates that the mean age of galactic globulars is more like 12.5 Gyr, comfortably smaller than the Expansion age. This represents the sum of all the data (not all independent) available since the repair of the Hubble Space Telescope. Information on these and other projects also may be gotten via links below. If you find errors or know of missing references, please contact the author.